The Full Time Wife: I'm a Mommy...of 16 Weeks! I'm a Mommy...of 16 Weeks! Let's see, my last post was in March and I bet that was posted on a decent day when I wasn't plagued with nausea and heartburn. These past three-four months I've been MIA from my blog for a very good reason...I'm 16 weeks pregnant! This has been an answer to our prayers and even though I had terrible pregnancy sickness, deep in my heart I was thankful for every unwanted pregnancy symptom that made my days miserable. My heart goes out to all mommies and future-mommies who have and will go through pregnancy sickness. To be honest, I thought I would be able to handle it well and still continue with normal day-to-day activities/chores but I was deeply mistaken. I can't tell you how much I hated the smell of my own home. I hated the smell of my fridge. Worst of all, I hated the smell of buttercream and all things sugary. Even the thought of baking and decorating a cake would send me straight to the bathroom. It was bittersweet when I had to cancel my Wilton classes. I was on a roll with this cake decorating venture but at the same time Life decided to take me on a hormonal ride called major pregnancy sickness . We shall meet again Wilton! For now, I'm currently enjoying my 2nd trimester and looking forward to learning more of what I can do to prepare for a baby. I look forward to sharing our baby story with you on my other blog...The Full Time Mommy (in construction). Found on Weffaroo's Photobucket. Too funny! 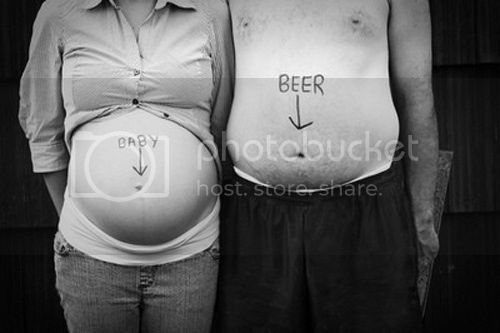 Found this one via Pinterest via 9laughs.com under Honest Pregnancy Announcement. I feel for the poor mommy but I love his enthusiasm.